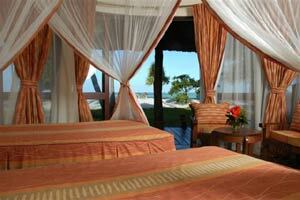 Ocean Paradise Hotel is located on the North East coast of Zanzibar, overlooking the turquoise Indian Ocean. It is a little piece of paradise enjoying an idyllic setting on 6.5 hectares beachfront property. Has serene and colourful gardens, touching the white sandy beach of the Indian Ocean. Ocean Paradise is an ideal for business, leisure, honeymooners and adventure lovers. African villages where the way of life has changed little for hundreds of years is quite inspiring. The Ocean Paradise Resort Zanzibar is stylish and tastefully designed in traditional African roundhouse chalets. The ambiance is inviting, friendly and unrivalled. The rounded chalets with their Pitched Makuti roofs in the vicinity beautifully landscaped flowery gardens touching the white sandy beaches, the swaying palm trees , the blow of cool ocean breezes in the backdrop of azure blue sea is a sight to behold. 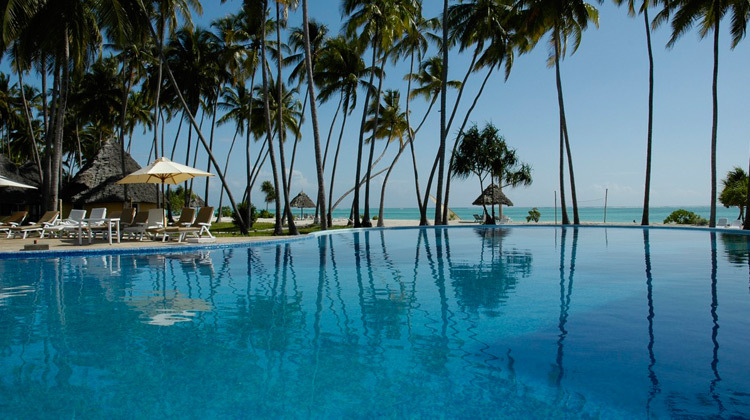 Ocean Paradise resort boasts of a PADI centre and the largest swimming pool in Zanzibar. Ocean Paradise Hotel Half Board Rates per Person. Designed as a traditional African roundhouse featuring all the creature comforts you could need, the rooms and suites are truly unrivalled. Each room is sea facing with large patio doors that opening to a private balcony, where you can sit and take in the sedate pace of African life. A peaceful sleep is guaranteed in a fully air-conditioned room with comfortable twin or king size beds draped with mosquito netting. The addition of satellite television, direct dial telephone, mini-bar, hair dryer and a unique curved en-suite bathroom, with shower, toilet and bidet, complete the facilities that will make your stay relaxed and enjoyable. The beachfront Mawimbi Restaurant serves sumptuous Zanzibar Fusion cuisine. Incorporating traditional Zanzibar ingredients with Asian and western influences this is the perfect setting for a romantic candlelit dinner. Each day, there is something different to keep you entertained. From traditional African dancers, acrobats and our resident band, to big screen sports broadcasts and sports competitions. Ocean Paradise boasts one of the largest and best equipped conference facilities in Zanzibar and has been host to numerous prestigious events. The fully air-conditioned main conference room seats up to 180 persons and features a built in screen and projector. Trained technicians can assist with high quality audio-visual equipment, ensuring your presentations are delivered professionally and your conference runs smoothly. For smaller meetings there is a boardroom to accommodate 20 people. For those incentive groups, a sales team is on hand to provide support for both the conference and social arrangements. You will find their knowledge of the local market invaluable in planning your event and their attention to detail will ensure that all arrangements are checked and double checked, ensuring a successful event and enjoyable stay. Zanzibar is renowned for some of the best diving in the world. PADI diving can be organized on site to suite your requirements. Full tuition and certification available for novices. Other water sports activities include windsurfing, sailing and kayaking, dolphin tours and boat trips. A dedicated tour office organizes visits to Stone town, Jozani Forest, dolphin and spice island tours. Other activities available include beach volleyball, billiards and table tennis, and competitions organized by our animation team. Ocean Paradise Hotel enjoys one of the most romantic and idyllic settings you could wish for, either for your wedding or honeymoon. If you want to tie-the-knot on a white sandy beach with a backdrop of the Indian Ocean, the resort will make your dream a reality. The resort will handle all your arrangements from the service to the celebrations that follow. Honeymooners get that extra special Ocean Paradise treatment. There’s a bottle of bubbly awaiting you in the room, a romantic lobster dinner on the beach and a room up-grade, subject to availability. Your honeymoon is guaranteed to be a relaxing affair, lazing by the pool soaking up the African sun or stretched out in a hammock under a shady tree. R&N Car Hire- For all your car hire and rental options in Kenya, Uganda, Tanzania, Rwanda, Burundi. Car hire and rental locations in Nairobi, Kampala, Kigali, Kilimanjaro, Arusha, Kampala, Entebbe and the airports thereof-Jomo Kenyatta Airport (NBO) or (JKIA), Kilimanjaro Airport (JRO) (KIA), Entebbe Airport ( EBB), Kigali Airport (KGL), Dar es Salaam Airport (Mawlimu Nyerere) DAR , Arusha Airport (ARK), Malindi Airport (MYD) , Mombasa Moi Airport (MBA).